LeoVegas is an online and mobile casino owned by LeoVegas Gaming Ltd that combines the best games from a number of leading software providers, including BetSoft, NetEnt and Quickspin. LeoVegas brings players more than 100 of the best online games on the web. Customers can try their hand at everything from regular video slots, classic slots and progressive jackpot slots to blackjack, roulette, table and other games. The casino is 100% mobile friendly and offers a massive number of games, including live dealer games, to play on the go. 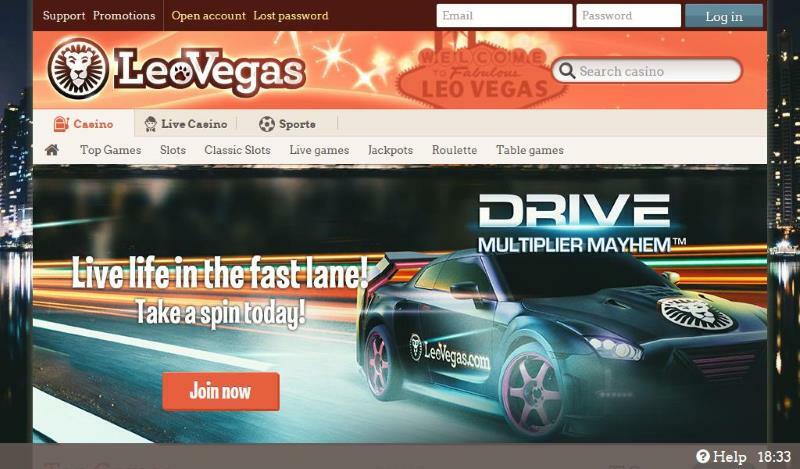 LeoVegas is powered by BetSoft, Microgaming, NetEnt, NextGen, Play’nGo, Quickspin and Thunderkick. The Casino Welcome Bonus Offers consists of four deposit tiers, where players can deposit and wager the required amount to get up £100 in cash and 25 Bonus Spins each time. Bonuses and free spins differ per country and are only available to users from Australia, Austria, Finland, Germany, New Zealand, Norway, Sweden, Switzerland and UK. There are recurring deposit and free spins promotions plus a loyalty program. LeoVegas support Bank Transfer, Mastercard, Neteller, Paysafecard, Skrill, Trustly and Visa. The withdrawal limit is €20,000 per month. The casino is available in English, German, Finnish, Norwegian and Swedish. Their helpdesk is available 24/7 by email and phone. Due to legal restrictions, players from Cyprus and USA are not allowed to play.